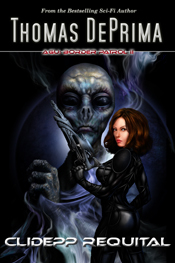 Just a quick reminder that the long awaited second book in the AGU: Border Patrol series, Clidepp Requital, is now available. The eBook is being distributed by Kobo, Apple, Barnes & Noble, and BookWorld (Australia). It's also available in Kindle and ePub formats through my website - www.deprima.com. The print version should be available through Amazon and Createspace very soon. IMPORTANT NOTE: Because of increasing SPAM attacks on my email box thomas@deprima.com, I'm removing that address from my server. All future emails will come from admin@deprima.com. Please adjust your firewall settings or address book to accept emails from that address. Thanks. Please add admin@deprima.com to your firewall or address book to ensure that our emails reach your inbox.